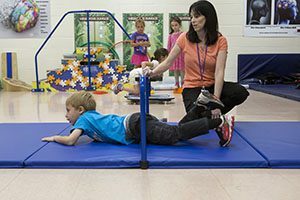 Take a look into one of the new Kinesthetic Learning Labs at Warwick Valley’s elementary schools and for a moment it may look more like a gym than a classroom. Students scramble over hurdles, toss beanbags at targets, and balance on a balance beam. There’s hardly a desk or a chair in sight, and absolutely no one is sitting still. 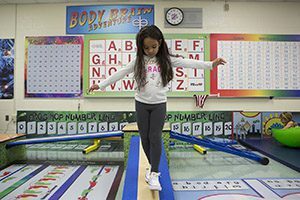 A student navigates the balance board in the Park Avenue Elementary Kinesthetic Learning Lab. And sure, it looks like fun, and there’s no doubt that it is; that accounts for the enthusiasm among the students when it’s their classes’ turn to visit the Lab. But there’s also plenty of learning going on, and while students are jumping, climbing, stretching, and swiveling, they’re also practicing their vocabulary words, reading, and reviewing math. Park Avenue and Sanfordville elementary schools. Balance boards, over/under bars, ladders, and mini obstacle courses now fill a large, bright room at each school. The rooms that now house the Learning Labs both used to be computer labs, now unnecessary because computers are now in every classroom at Warwick Valley’s two elementary schools. “These labs were conceived by understanding that our students do need movement throughout the day. We had experimented with flexible seating in classrooms and this was the next step to support our youngest learners,” said James Yap, Warwick Valley’s Assistant Superintendent of Instruction. Kinesthetic Learning Lab are based on research that finds a strong link between physical activity and academic performance. Motion helps students concentrate, learn, and retain information in ways that sitting still at a traditional desk doesn’t, studies have found. Studies show that learning is reinforced when combined with motion. “When you sit still for more than 20 minutes your mind thinks it’s time fall asleep,” Mr. McElroy said. Boredom can set in, and students lose focus. In the Learning Labs, activities are designed to be energizing and invigorating – not strenuous or exhausting – and just enough to get the brain working at its best. “There’s no resistant movement,” he said. 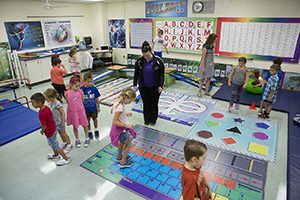 Kindergarteners and first graders are the first to visit Warwick Valley’s Kinesthetic Learning Labs, but all elementary students will get time in the Labs, where equipment and activities are set up as stations. Students spend a few minutes at each station, then rotate to a new one. Flip chart holders, posters, and even word walls are used to present information, such as spelling words, equations, or test review. On an obstacle course they may have to work a math problem before advancing; at another station, they might study spelling words as they work on the stair-walker, skier, and snowboarder. “It is a thrill to see students learning phonemes while throwing a bean bag to the right sound on the letter board, and balancing themselves on the balance beam all at once,” said Park Avenue Elementary Principal Sandy Wood. Teachers – along with a specially trained teachers assistant and, often, a physical education teacher – are with their students in the Lab and can easily customize lessons daily. And although the room resembles a playground, these kids are working both their bodies and their brains, and the atmosphere is one of controlled concentration. A student does the alligator crawl in Sanfordville Elementary’s new Kinesthetic Learning Lab. Learning new material and the reinforcement of skills are just two benefits of the Labs, said Park Avenue teacher aide Jeanne Long. Kinesthetic learning also helps educators spot deficits, she said, because students will hesitate or slow down when they’re stumped by a question or can’t recall a fact. For the students, though, the Labs are a welcome addition to their school day, a lesson they look forward to.